My name is Amara Majeed, and I am a 19-year-old Muslim Sri Lankan American. I am a student at Brown University, studying cognitive neuroscience and public policy. When I look at the photo circulating of a woman in Nice being surrounded by armed police officers as she is coerced into removing her clothing, because French officials deemed the burkini to be inappropriate beach attire, I see infringement on a woman’s right to choose what she puts on her body by a group of white males. I see the scapegoating, ostracization, and criminalization of Muslims in the aftermath of the Nice terror attacks. I am a woman who wears the hijab, and I see an affront to the rights and civil liberties of women like me. Deputy Mayor of Nice, Christian Estrosi: You have stated that you support this ban on “inappropriate clothing” in the wake of the Nice terror attacks. Mayor Vivoni, you have described the burkini ban as a necessary measure to “protect the population." Former French president Nicolas Sarkozy, you have labeled the burkini as a symbol of extremism. Tell me, in what way does our way of dress pose a threat to France’s national security? In what way does the burkini propagate hateful, violent ideologies? Let me respond to all of you by saying this: any conflation of the burkini with terrorism is invalid, virulent, and discriminatory. Tell me, in what way does our way of dress pose a threat to France’s national security? In what way does the burkini propagate hateful, violent ideologies? 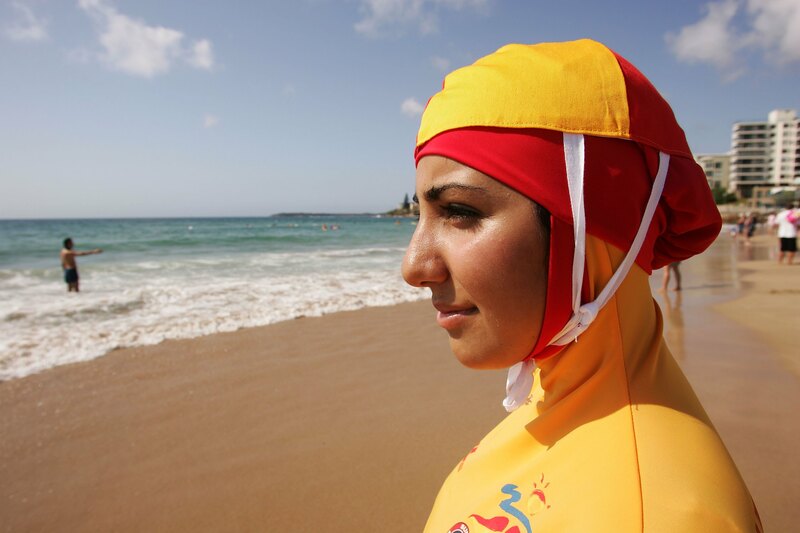 How is it that our way of dress poses a national security threat, yet some wetsuits, which take on strikingly similar designs to the burkini, aren’t? While France's highest administrative court has now overturned the ban, the damage has already been done— this attack on the Muslim way of dress only serves as fodder to the already existing rising anti-Muslim sentiment and stigmatization of Muslims in France. If this institutionalized Islamophobia and fear-mongering is being perpetrated by French officials and authorities, I fear how the general public’s poor treatment of hijab-clad women may be exacerbated in the coming weeks. We're all well aware that hate crimes and violence targeting Muslim women wearing the hijab is not a new phenomenon in France. As one burkini-clad woman who was forced to leave the beach states, “Because people who have nothing to do with my religion have killed, I no longer have the right to go to the beach.” In the eyes of many authority figures, our religious identity in and of itself is incriminating. Our way of dress is incriminating. Our sheer existence is incriminating. Many of you have called the hijab an emblem of oppression. In April, France’s Minister for Women’s Rights equated women who choose to wear the hijab with “Negroes who were in favor of slavery.” More recently, France’s prime minister stated that the burkini is a tool of “enslavement,” and former French President Sarkozy insinuated that hijab-clad women are imprisoned. The hijab does not oppress me. By depriving us of our rights to dress the way we want, by making public spaces inaccessible to us, by publicly humiliating us, you are oppressing us. I am genuinely tired of individuals like you imposing your brand of colonial feminism on us and telling us that we are oppressed, that we have been indoctrinated, that this was not our choice, and that we need to be unshackled. Instead of continuing to pursue these offensive and failing attempts at liberating us, I implore you to liberate yourselves from this white savior complex and recognize that we don't need your saving. The hijab does not oppress me. For me, the hijab is a symbol of feminism and freedom of expression —so who are you to invalidate my experiences, to invalidate a fundamental, inextricable aspect of my identity, and to label me as enslaved, as imprisoned, as oppressed? By depriving us of our rights to dress the way we want, by making public spaces inaccessible to us, by publicly humiliating us and coercing us to remove some of our clothing while we are trying to enjoy a day at the beach — you are oppressing us. My news feed has been saturated with people posting photos of a Muslim woman at a beach being forced to strip, captioned with outrage and vitriol towards this form of discrimination. While your support of our rights is appreciated, I ask that you refrain from doing a disservice to this individual by circulating this photo. It may not seem like you are violating a woman’s privacy and liberties by sharing a picture revealing her arms or shoulders, but it is incumbent upon us to understand that she did not freely choose to show those parts of her body in public. Even if the intent is to excoriate the burkini ban while circulating these photos, I implore you to not be complicit, whether directly or indirectly, in systems of oppression that are stripping women, literally, of their right to choose what they wear.